The liners and medium that make up the corrugated sheet are both forms of paperboard. Paperboard is made primarily from cellulose fibers found in wood. The fibers are held together by lignin . Fibers are separated from the wood in one of three ways: mechanical, chemical, & semi chemical. Mechanical involves chipping and grinding the wood into increasingly smaller units. Chemical separation, or pulping, uses sulfite or sulfate to dissolve the lignin. This is also known as the Kraft process . This method produces the highest yields with the least damage to fibers, thus the strongest paper. The semi-chem process combines the mechanical and the chemical methods. Linerboard is the paperboard used as the inner and outer facings of a corrugated sheet. It is made primarily through the chemical process. It is usually made from softwoods like Pine trees that have the longest fibers and produce the strongest board. Medium is the fluted paperboard that is in between the inner and outer facings. It is produced mainly from hardwoods that have shorter fibers through the semi-chem process. Linerboard and medium are also made from recycled resources. Lumber byproducts like sawdust and wood chips constitute approximately 10% of the fiber supply. Recycled paper provides approximately 25%. The fibers are separated from wood or recovered through recycling processes and cleaned. Liquid paper then flows onto a moving wire screen. Water drains through the wire until it hits the dry line where a paper mat is formed. The paper is cycled through the paper machine where it is further dried, compressed, and wound into large rolls that are shipped to customers that manufacture corrugated sheets. 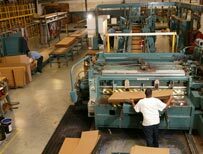 Copyright© 2005 Richmond Corrugated, Inc. All rights reserved.